A lie repeated a thousand times does not become true by the telling. The skillful crafting and republishing of what were once openly known to be outright lies has become a serious snare at the present time. The present Pope of the Vatican, for all his feigned humility and integrity, is happy to have the Vatican’s collection of anti-historical lies held out as facts for recognition and respect on the world stage. The article below refutes the Pope’s claims to both titular supremacy over Christendom and respect in terms of unique religious holiness. It especially identifies the context of the republished claims in relation to the current world political situation. The article is presented with the sincere hope that by careful consideration and reference to the Scriptures, you will reject the false claims of the Papacy and take a committed personal stand for the Gospel of Jesus Christ the Lord. 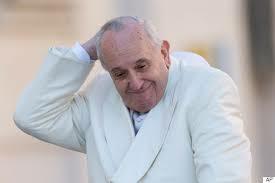 Under the title of Holy Father1, Pope Francis is due to visit the USA in September 2015. Thus, we ask the question, “Who truly is the Holy Father?” A Christian’s relationship with the Holy Father is crucial. Thus, Jesus Christ prayed, “Holy Father, keep through thine own name those whom thou hast given me, that they may be one, as we are.”2 Only those who have been placed in Christ Jesus by God’s grace alone have the right and privilege to call Holy God their Father. Nevertheless, the Vatican both teaches a different gospel and, on its website, claims a successive chain of 266 “holy fathers,” or popes, from St. Peter to Pope Francis. In Christendom, the great visible center of religious life is the Pope and the Vatican. Papal Rome enjoys its apparent worldly pre-eminence and exercises an authoritarian dominion over the political and religious thinking of hundreds of millions. However, the true Kingdom of God in the spiritual body of Christ continues its triumphant growth under the direction of the Lord Jesus Christ by His Spirit. Hidden from the view of the world and not perceptible as an institutional force, the true Church remains the ultimate fact of human history yet to be fully revealed at the Lord’s return. Of these two contemporary entities, the Vatican has, according to the revealed will of God, unhappily proven itself to be the most dominant, as the Pope plays a major part on the stage of world history leading up to the return of the Lord Jesus Christ. It is critical to appreciate the contemporary context in which the Roman claim to historical-political priority and Church preeminence is being reasserted on the world stage. The aggressive regeneration of orthodox Islam in general and ISIS in particular is focusing the Western world back to toward the consideration of religion as a force with which to be reckoned politically. With the Muslims knowing their religion’s history back to Muhammad, it makes sense that the Papacy would republish in 2015 its claim to a religious history allegedly more ancient and potent than Islam. Moreover, the balance of political power world wide is shifting. Particularly in times of such shifts, the Papacy is ever ready to present what appears to be an established stability in the midst of growing disorder and uncertainty. With the 2015 posting of its unbroken line of popes from Peter to the present Francis, comes the Papacy’s not so subtle reminder of its claim to have been established by God. It is time to set the record straight. The statement by Richard P. McBrien utterly undermines the basic premise of the Vatican. In fact, from the Apostle Paul’s letter to the Romans, it is apparent that the pastors i.e. bishops of Rome faithfully treasured the Gospel of salvation. Under severe persecution from the Roman emperors these normal pastors and their congregations remained faithful. The spread of the Christian faith during the first three centuries was rapid and extensive. While under persecution, the pastors, i.e., the bishops of Rome, were faithful and zealous in preaching the Gospel of grace. The persecution of Christians ended in A.D. 313 when Emperor Constantine proclaimed the Edict of Milan. In A.D. 330, Emperor Constantine (the Caesar) moved the seat of the Imperial Roman Empire from Rome to Constantinople. By that time, he had decreed Christianity the religion of the Empire in hopes that by means of its acceptance a new unifying strength could be infused into his crumbling empire. Thus, in those early years of the fourth century, the bishops of Rome claimed to be the successor of Caesar; i.e., the rightful heirs to the Caesars. On the far left is a coin of Caesar Augustus, 27 B.C. On the right, a coin of Pope Leo XIII. They both bear the abbreviation PONT MAX, standing for Pontifex Maximus; one of many examples of popes appropriating Caesar’s title.6 Much later in the early fifth century, was the bishop of Rome called the successor of Peter. Thus, it was that Innocent I (401- A.D. 417.) held that the bishop of Rome as Peter’s successor was entitled to exercise Peter’s power and prerogatives.7 Later again in the fifth century, it was more fully formulated in the teaching of Bishop Leo I (440-461). The fact, however, stands that Scripture is utterly silent about the Apostle Peter going to Rome. His visits to Samaria, Lydda, Joppa, Caesarea and Antioch were carefully recorded. But there is simply no mention made of his going to Rome, which is essential to establish the Roman Catholic position.8 Clearly the presupposition that Peter was in Rome as its first bishop is just a tradition. Literally, it took hundreds of years before the tradition that Peter was the first bishop in Rome was believed and that he had successors in his role of bishop of Rome. Justinian’s decree did not create the “Status of the Bishop of Rome” but rather set a legal foundation for the acquisition of civil ruling power by the bishops of Rome. Soon after Justinian’s decree, the bishops of Rome began to reign like kings. Vitalian, the Bishop of Rome from A.D. 657-672, was the first to actually be addressed with the title “Pope,” when he was called in Latin, “Papa Vitalianus”; i.e., Pope Vitalian.10 It took time for the pope of Rome to spread the exercise of his state-given title over the other bishops of Europe. For example, even in northern Italy in A.D. 800, Claude, the bishop of Turin, did not recognize the bishop of Rome’s authority.11 Quite apart from the work of Justinian to formalize the civil authority of the “bishop of Rome,” the Vatican and its hierarchy itself later perpetrated manifest historical frauds by outright forgery in documents such as the “Donation of Constantine.” This document purported to be a legal document in which Emperor Constantine bestowed on Sylvester Bishop of Rome (314-335) much of his property and invested him with great spiritual power.12 The purpose of this fraud was to provide a foundational documentary authentication, albeit entirely false, declaring the ecclesiastical power of the popes during the Dark and Middle ages. From the fourth century through the eighth century, much of the growth of papal power was acquired in trade-offs with kings throughout what had been the old Imperial Roman Empire. In the eighth century, when the pope needed defending against the Saracens and the Lombards, the French kings provided it and presented the pope with ruling title to the cities they had won. As a reward, in A.D. 800, Pope Leo III notably crowned Charlemagne as emperor. Thus began the Holy Roman Empire, and consequently began turmoil over issues of the legal limits of jurisdiction of the pope on one hand, and the emperor on the other. These issues were traumatically worked out throughout the actual course of history.13 In 1203, as head of the state religion, Pope Innocent III began to demand, through his Courts of Inquisition, subjection to Roman Church’s doctrines and traditions and had them enforced by civil law. Honorius reigned from 625 to 638. He was condemned as a heretic by the Sixth Ecumenical Council (680-681). He was also condemned as a heretic by Pope Leo II, as well as by subsequent Roman popes.14 In 903, Pope Leo V reigned only for one month because Christopher, a cardinal priest of San Damaso, had Leo put in prison and declared himself pope. Then Christopher was overthrown and put in prison by Sergius. Leo was murdered while in prison, and Christopher was murdered while in prison on orders of Sergius.15 Sergius reigned as Pope Sergius III from 904 to 911. The immoral murderer Sergius III is number 120 of the Vatican’s list of “Holy Fathers.” Pope John XII reigned from 955 to 963. “Elected at age eighteen, he led one of the most immoral lives of any pope in history and died of a stroke, allegedly in the bed of a married woman.”16 The notorious Pope John XII is number 131 of the Vatican’s list of “Holy Fathers.” The dominant Crescentii Family played an important part in the history of making and unmaking of Roman popes from the middle of the tenth through to the eleventh century. Thus, Count Theophylact of Tusculum, in what became the Tusculan political family, began making and unmaking of the Roman popes. In fact, for two centuries the status of being pope was an arena of confusion, as the Crescentii and Tusculan families of Italy disputed and fought over it like a possession. The year 1073 was a turning point from the centuries of gross immorality. Rigorous discipline now became the norm of the Papacy. Reaching above the lusts of the flesh, the lusts of papal minds continued to clutch at total dominion, both ecclesiastical and civil. Pope Gregory VII (also known as Hildebrand) was ambitious beyond all who had preceded him. He was convinced that the reign of the pope was in fact the reign of God on earth and determined to subject materially all authority and power, both spiritual and temporal, to the “chair of Peter.” It was Gregory VII who envisioned what was to become the vast structure of the Papacy. His goal was to be the supreme ruler and judge of all leaders, both Church and State. The supremacy, which he claimed by divine right, demanded sure dominion over both emperors and kings. The material supremacy of such a notion was not won in a day. However, it was Gregory VII’s astute grasp of the notion, and his crushing ambition, coupled with the enormous wealth that the Roman Catholic Church by then possessed, which made its implementation possible. These shrewd enactments began to bear fruit even during Gregory VII’s own rule (1073-1085). The Popes that followed him developed the structures he had established. They continued his projects and strove by deceit, by crusades, and by interdicts to place the world under papal, political control. For two centuries from the time of Gregory VII’s reign, the papacy increased in power and glory, always at the price of thousands of destroyed lives, many deposed kings, and princes, along with numerous ruined cities and countless homesteads and farms utterly wasted, all in the name of the religion of Rome. Popes Innocent III (1198-1216) and Boniface VIII (1294-1303) put the final touches to papal triumph of spiritual and temporal power. Pope Innocent III proclaimed a warring crusade against the Albigenses and offered to all who would engage in it the pardon of all sins to get to heaven without passing through purgatory. It was a war perpetrated with unimaginable cruelty. Whole villages and towns were indiscriminately butchered; thousands were burned at the stake, while others were subjected to the most hideous torture. The history of these horrendous deeds of cruelty and murder are established by numerous accounts. Pope Boniface VIII was stubborn, ambitious, intelligent, vain, and unscrupulous. He believed deeply that the pope was literally the Vicar of Christ on Earth and that he held extraordinary powers. He is most famous for a statement in his papal bull Unum Sanctum, “We declare, say, define, and proclaim to every human creature that they by necessity for salvation are entirely subject to the Roman Pontiff.”17 Seventy-five popes, one after another, from Pope Innocent III to Pope Pius VII, approved of torture, murder, and burning at the stake, and the confiscation of property in the horrific centuries of the Inquisition.18 Many of those tortured and slain were true Bible believers. While the Papacy no longer has the military might by which to enforce its will, it has in no way renounced its sovereign control over men’s minds and bodies, as Catholic law shows. Of necessity, then, to reintroduce coercion of any consequence, there must first be enacted absolute law within the Catholic system. Second, it is necessary to ensnare the civil authorities in such a way that they are again subservient to Catholic purposes. Because the Papal Church is also civil power, known as the Holy See, it has been able to advance its status by diplomatic agreements called “concordats.”19 Prior to 1989, the Holy See signed international agreements primarily with European and Latin American countries. Vatican control can be seen very clearly in those nations where concordats have long been established, as for example, in Germany under the extant concordat worked out between Pius XII and Hitler. The Vatican’s desire to maintain civil relations with other nations is now greater than ever. From 1950 to 1999, 128 concordats were signed between Rome and various states. In the course of nine years, 43 concordats were signed between the Holy See and other nations. Even nations of the Middle East, Asia, and Africa are entering juridical agreements with Rome. Moreover, the Roman Catholic Church has much influence in national and international laws, particularly in the nations in which she has papal nuncios as ambassadors. At present, she maintains diplomatic relations with 179 countries at embassy level. The political civil power is subordinate to the spiritual control of the Roman Catholic Church and is each individual pope’s necessary instrument used to fulfill his aspirations and objectives. Thus, while the wickedness of the popes is no longer overtly shown, it is seen sinisterly in its civil legal power. The Catholic news agency ‘Zenit’ normally calls the Pope the “Holy Father.” In fact for most Catholics the term “Holy Father” usually means the Pope. John 17:11 The Lord Jesus uses the term “Holy Father” exclusively in speaking to His Father. Roman emperors held the title of Pontifex Maximus signifying that they were the highest pontifex or priest in ancient Rome. Thus it was that four centuries had passed before the claim to be Peter’s successor was made. Certainly the Holy Spirit would not have passed over an event so significant and essential. In his letter to the Romans, the Apostle Paul greets many in the Church at Rome but offers no salutation to Peter. The same Apostle Paul, being at Rome in the reign of Emperor Nero, never once mentions Peter in any of his letters written from Rome to the churches and to Timothy, although he does remember very many others who were with him in the city. It was only after Bishop Claude’s death, as the Gospel and the Bible were removed, that this area fell to the Roman bishop’s authority. William Webster, The Church of Rome at the Bar of History (Banner of Truth Trust, 1995) pp. 63-71. Peter DeRosa, Vicars of Christ: The Dark Side of the Papacy (Crown Publishers, 1988) pp. 208-209. (De Rosa is a practicing Catholic and a former Catholic priest.) See also Catholic theologian Hans Kung, The Catholic Church: A Short History (Modern Library Paperback Ed., 2003) p. 60. A concordat is an international contract, which legally binds the nation involved and the Vatican. A concordat also establishes rights such as that of defining doctrine; educating Roman Catholics in the tenants and practice of their faith, an education which touches every area of their lives including their understanding of economics (which is socialist); negotiating laws regarding church property. Such legal issues are agreed on in civil law between the “Holy See” (as she in her position as a sovereign state is legally called) and the other nation.